I am an immigrant to the United States. I arrived as a young child from a country where a military dictatorship had ousted a democratically-elected government. In 1974, when I was 16, my high school history teacher suggested that I apply for a position that our local congressman had posted in the paper. Rep. Ben Gilman (R-NY) was in his first year in the House. He conducted an open competition for his first sponsorship of a page. There was an application, a test, an essay, staff interviews, another essay, and then a final interview with the congressman himself. I made the cut, and reported for duty on June 1, two weeks after my 17th birthday. He swore in the rest of the incoming class, then tasked an aide to research the requirements. After several hours of looking, the aide reported that there was in fact nothing in writing requiring citizenship. The Doorkeeper told me to stand and raise my hand. He swore me in, and I went to work. This was the first session of the 93rd Congress, under Speaker Carl Albert. 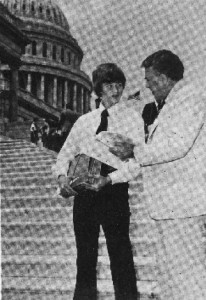 This was also the summer of the Watergate hearings, and one of my first tasks was distributing to members on the floor the Writ of Certiorari asking the Supreme Court to take the case United States v. Nixon, after the President had refused to comply with a district court order to release certain tapes and documents to a special prosecutor. I also took the opportunity to read that writ. Throughout my tenure, I would take as many trips as I could to watch the House Judiciary Committee consider impeachment proceedings against the President. And I got to witness such leaders as Rep. Peter Rodino, Rep. Barbara Jordan, Rep. Charles Rangel, and Rep. Robert Drinan speak eloquently about how no individual, however powerful, was above the law. When the president resigned on August 8, I was blown away. This immigrant kid had a front-row seat to history; to a peaceful transition of power. I said, “I want to be part of this.” As soon as I turned 18 I applied for citizenship; I became a citizen three years later. In college I majored in political science, with a specialty in congressional procedure. I later went to graduate school, and have been both a business consultant and business professor for more than 30 years. Early in my career I was a registered lobbyist and got legislation introduced in the House and Senate. My work and teaching have taken me to dozens of countries on six continents, and I do meaningful public service, mostly as a volunteer on not-for-profit boards. Most of my graduate students are from outside the U.S., including from countries where citizens have no role in electing a government. I spend a lot of time helping them decipher what’s happening in American politics and government. I’m proud to be one of Democracy’s Messengers. Helio Fred Garcia, House, Summer 1974, is the president of Logos Consulting Group and an adjunct professor at New York University. He also holds faculty positions in Europe and China.